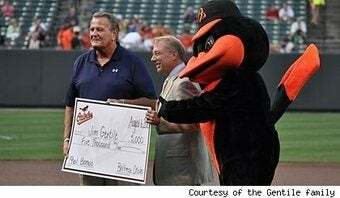 Well lookie what happens when the Baltimore Orioles manage to win a few games in a row: They walk big ceremonial checks out at Camden Yards and make a scene about rewritten baseball history. [L]ast week, baseball acknowledged that Maris had been credited for one RBI mistakenly. A run had scored on an error, not when he batted it in. So baseball took away that RBI, leaving him with 141. And that made Gentile the RBI king — tied with Maris — for the year. In related news, orange-and-black spit found on a gravestone at Holy Cross Cemetery in Fargo, ND.